Home > T-Shellz > (LARGE) Shoulder T-Shellz Wrap - Use on Either The Left or Right Shoulder! Please Note: The Large Shoulder T-Shellz Wrap fits someone who wears a Large or XL+ sized Shirt. Fits A Chest Size of Between 40 inches and 60 Inches - Adjustable Velcro Straps. The NEW Shoulder T-Shellz Wrap can be used on either the Left or Right Shoulder. 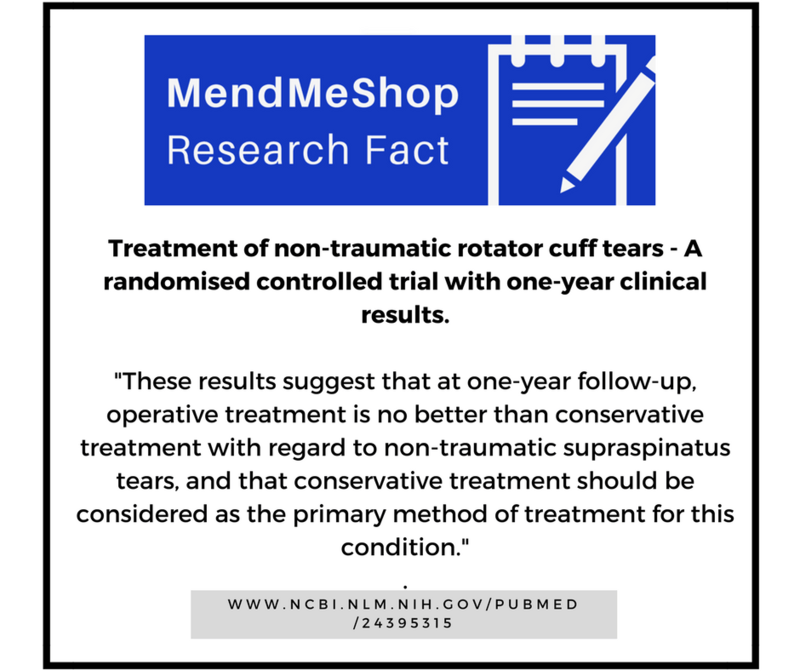 This dual purpose versatility gives you the ability to focus on treatment of the injured shoulder - while still having the ability to treat the opposite shoulder (which will bear more stress as a result of you protecting the injured side). 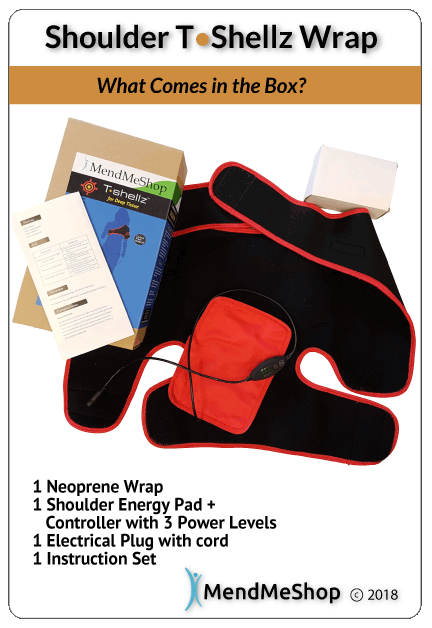 Helps Treat Rotator Cuff Tears, Shoulder Tendinitis, Frozen Shoulder, Bursitis, Shoulder Impingement, AC Joint Separation, Supraspinatus Tendinitis, General Shoulder Tightness and Stiffness and Chronic Shoulder Pain - Safely, Naturally and Effectively! 1. Well to begin, the T-Shellz wrap uses a very soft neoprene that feels very comforting on the body. It hugs the body in a very serene way. You will love how it feels! The Large T Shellz Wrap uses adjustable velcro straps and will fit a chest size of between 40 and 60 inches. Before exercise or workouts to warm up your Shoulder to prevent injury. You will also want to consider using the T-Shellz before situations where you will be engaged in light to moderate lifting or any repetitive activity where your arms are utilized. 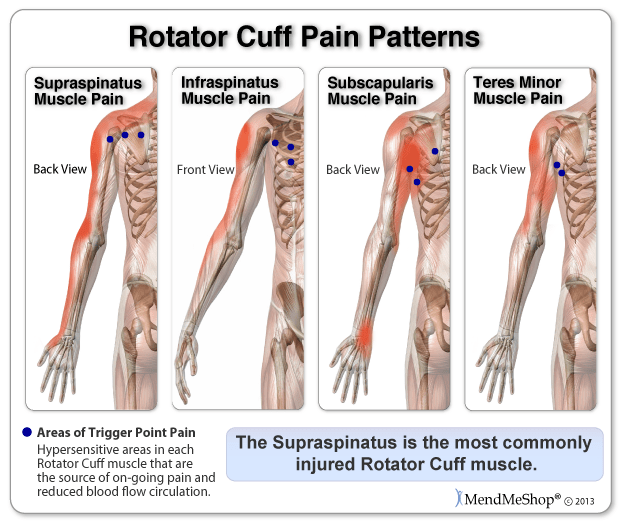 Any time your Shoulder feels tight, reducing your mobility and causing pain (especially in the morning or after sitting for extended periods of time - at home, work, commuting, etc). On a consistent, daily basis if you are dealing with a more chronic Shoulder issues where scar tissue has developed and is leading to a cycle of re-injury and re-aggravation. 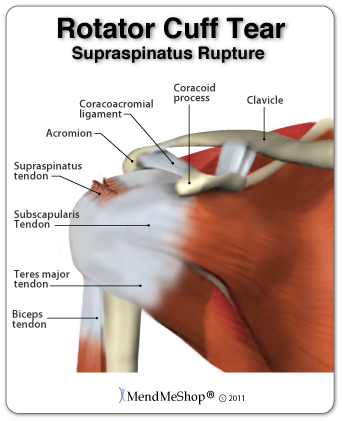 Also in cases of Frozen Shoulder, Adhesive Capsulitis, or a Separated Shoulder. 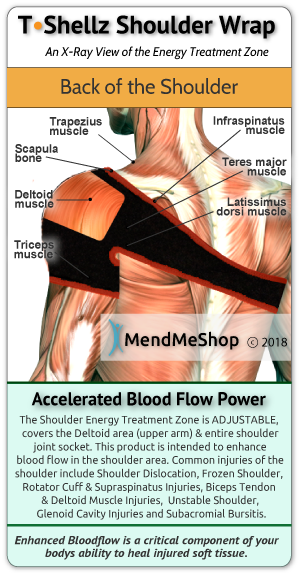 And any other situation where you need to increase blood flow to your Shoulder to relax your soft tissue, relieve pain, prevent re-injury and enhance the flexibility of the targeted area! 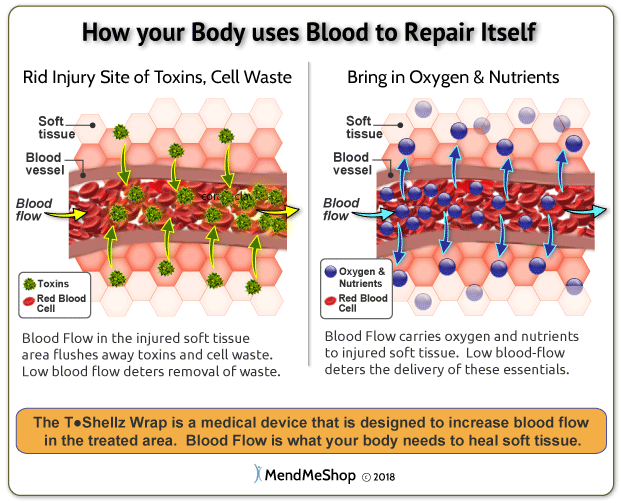 As a general rule, people will use the Shoulder T-Shellz Wrap approximately 3 times a day - before bed, upon awakening, and one other time corresponding with one of the situations mentioned above (perhaps an hour or so after work, before exercise, etc). You are always welcome to contact us to find out the optimal times to use your T-Shellz Wrap based on your daily routine/schedule. Please note that individual results may vary. 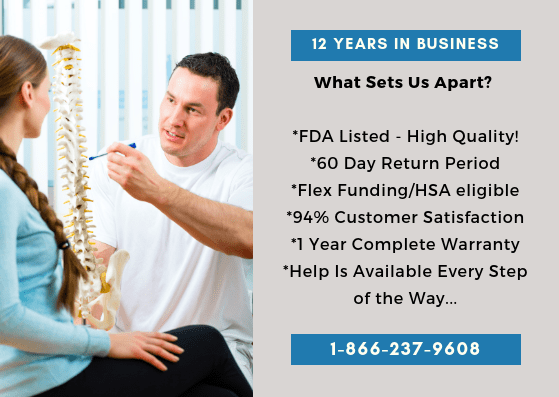 The information provided on this site is not intended as a substitute for advice from your physician or other health care professional. 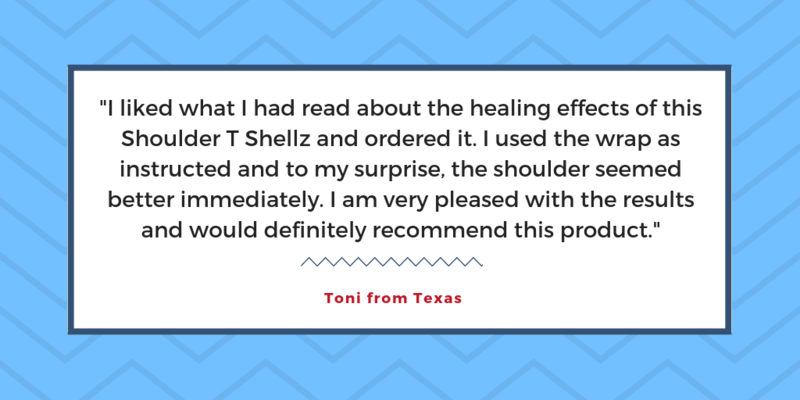 The unique Shoulder T-Shellz Wrap is designed with every detail in mind to give you the most effective and most enjoyable therapeutic experience available anywhere. Here’s why! 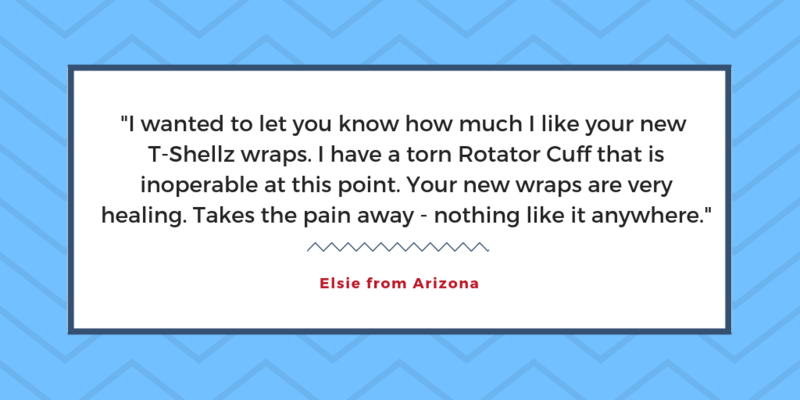 What can a Shoulder T-Shellz Wrap® Treat? Practically any condition or injury affecting the shoulder can benefit from treatment with the Shoulder T-Shellz Wrap. Just a quick note to tell you how much help the MendMeShop wrap has been to me. 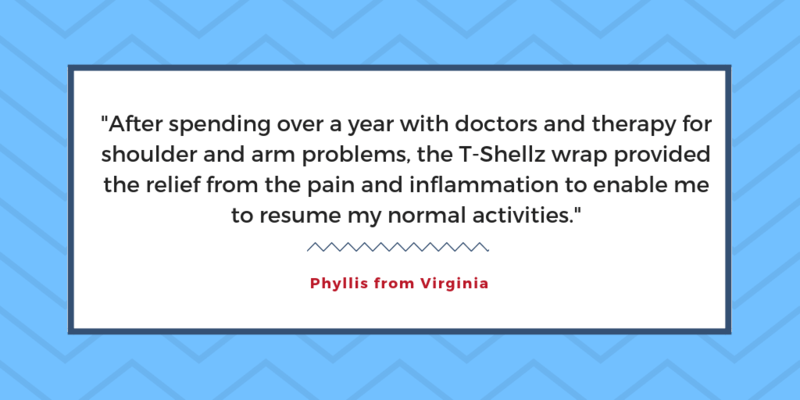 After spending over a year with doctors and therapy for shoulder and arm problems, the T-Shellz wrap provided the relief from the pain and inflammation to enable me to resume my normal activities. I would not be without it. I particularly like the fact they require no mess and little effort –just put the wrap on and sit back and relax. I also very much appreciate the excellent staff for their knowledge and patience whenever I call. I can’t ask for more! Thank you so much.. I've had my shoulder wrap for 24 hrs and I can already tell a difference, not only with the wrap, but with the arnica cream. I love arnica. I've used it before and it works wonders. Thank you so much for this theraputic, less invasive treatment. It's amazing. I actually had a 30 minute nap. I haven't been sleeping because I've been in so much pain. I didn't mean to take a nap, but I just fell asleep (not with the wrap on). I NEVER nap. I'm always too busy. LOVE this wrap and I'd buy it again if I needed to. I liked what I had read on the internet about the healing effects of this Shoulder T Shellz and ordered it. I used the wrap as instructed and to my surprise, the shoulder seemed better immediately. The first 5 days I used level 1 for 30 minutes at a time, and then moved on to level 2. I never made it to level 3 but have continued using it and the Arnica Infusion cream that I love. I have very minimal pain for just a month and a half into this injury and able to do most everything now. I am very pleased with the results and would definitely recommend this product. Have used this product for the last couple of months for rota-tor cuff / bicep tendentious from tennis. Went to two orthopedic Dr + physical therapy for 2 months with not much success. This product is the only product that has worked for me. I'm not sure I understand the bio-science that it does, but what i can say that it works and does make a difference. Highly recommend this product. I wanted to let you know how much I like your new T-Shellz wraps. I have a torn Rotator Cuff that is inoperable at this point. Your new wraps are very healing. Takes the pain away - nothing like it anywhere. I would recommend it to everyone with shoulder pain problems. That T-Shellz wrap has worked fine and my shoulder is back to being as good as it can be. So thanks for good products and good service. God bless you all and keep up the good work in 2019! Torn tendons - pain free in six weeks of once per day use. Prior flareup took four months for pain to ease without T-Shellz wrap. Amazing! I had rotator cuff surgery last year and still use this T-Shellz wrap daily. I had a repeat MRI recently which showed the tendon had healed well. My surgeon was surprised. I think he said something to the effect of " that healed great, better than great, far better than expected." So I recommend your product to others whenever I can.